Eight years ago, when we moved into our present home, we bought our first set of grown up furniture for our living room (translation: not hand me downs or thrift store finds). We’ve loved the leather couch, love seat, and chair that we purchased. They are a small scale, have classic lines, and have held up well. Except for the chair. Somehow the seat cushion started to crack and unnamed children began peeling the leather from its backing. Before we knew it the chair was an eyesore. Unfortunately the cushion couldn’t be turned around because it is sewn into the chair. This summer we moved it into the master bedroom so Tom would have a place to sit while he was recovering from surgery and didn’t feel up to tackling the stairs. 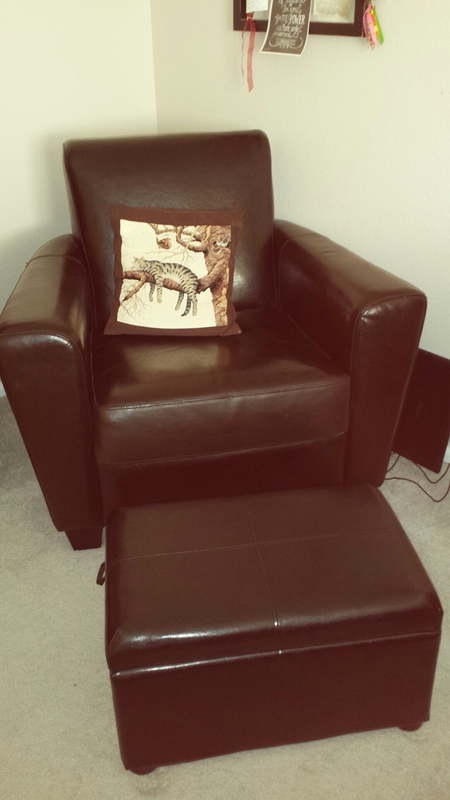 We really liked having a chair in the bedroom and didn’t care so much about how it looked. While my mom was here and looking for things she could do around my house to help, she started thinking about how to repair the chair. 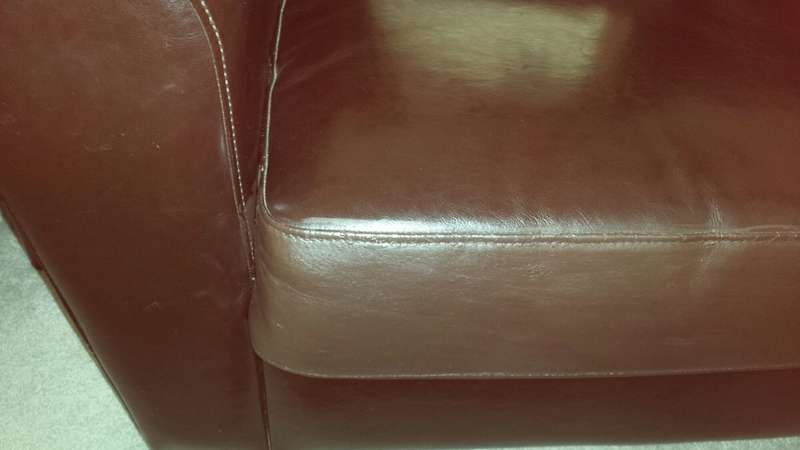 First we thought we could stitch new leather to the chair or glue it in some way. Then we looked at car upholstery solutions. I happened to be reading one of my DIY blogs and saw a post where someone had painted their couch to cover up old fabric. I looked at my chair and thought maybe that would be the solution. So I bought a small bottle of the darkest brown paint I could find, a bottle of black, and a bottle of fabric medium (an additive for acrylic paint making it suitable for fabric applications). Then I set to work. I gave it three good coats, letting it dry between each layer of paint. I think it looks good enough that I could move it back downstairs. But it’s staying in my room. I always wanted a cozy place to curl up with a book! It looks great Johanna! I would have never known that it had cracks. Great job! Wow, It looks wonderful I have such a talented daughter.